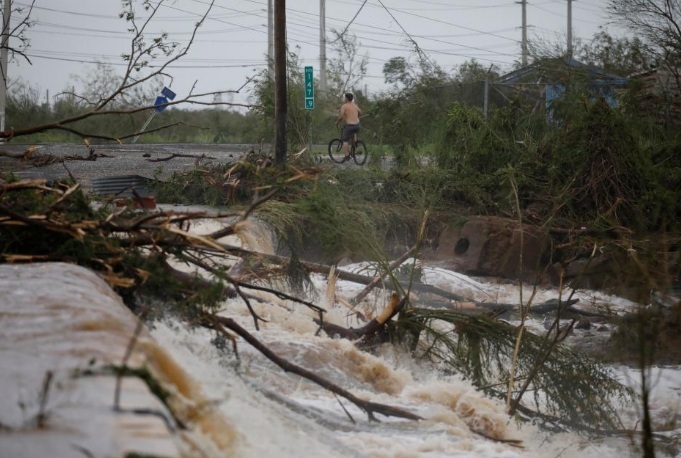 A man rides a bicycle next to a flooded road after the area was hit by Hurricane Maria in Guayama, Puerto Rico September 20, 2017. SAN JUAN, Puerto Rico - Hurricane Maria, the strongest storm to strike Puerto Rico in nearly 90 years, carved a path of destruction through the U.S. territory on Wednesday, causing severe flooding and plunging the island into darkness as the storm’s death toll in the Caribbean rose to at least 10. Maria, the second major hurricane to rage through the region this month, was left considerably weakened by its encounter with Puerto Rico and on a course projected to pass north of the Dominican Republic, the Miami-based U.S. National Hurricane Center (NHC) said. Hours earlier, Maria pummeled St. Croix, the largest and southern-most of the U.S. Virgin Islands, as a rare Category 5 hurricane on the five-step Saffir-Simpson scale, causing widespread heavy damage. Moving on to Puerto Rico ranked a Category 4 storm, with sustained winds of up to 155 miles per hour (250 km per hour), Maria ripped roofs from buildings and turned low-lying roadways into rushing debris-laden rivers as it cut a diagonal swath across the island. “It’s nothing short of a major disaster,” Rossello said in a CNN interview, adding it may take months for the island’s electricity to be completely restored. Earlier he imposed a dusk-to-dawn curfew for the island. Virtually the entire island was left without electricity as night fell, said Pedro Cerame, a spokesman for the governor. By 8 p.m. EDT (midnight GMT), Maria’s center was drifting away from Puerto Rico and was located 55 miles (90 km) off the eastern tip of the Dominican Republic, the NHC said. As is typical for hurricanes passing over hilly or mountainous terrain, Maria was markedly diminished by the time it crossed Puerto Rico, with top wind speeds reduced to 110 mph (175 kph), though the NHC said the storm was likely to regain some strength in the next day or two. Maria was expected to skirt past the northeastern coast of the Dominican Republic Wednesday night and Thursday before approaching the Turks and Caicos Islands and southeastern Bahamas on Thursday night and Friday, the NHC said. So far, it looked unlikely to threaten the U.S. mainland. Storm-related rainfall was expected to range from 20 to 25 inches (50 to 65 cm) on much of Puerto Rico through Friday, according to NHC. Maria was classified a Category 5 storm when it struck the eastern Caribbean island nation of Dominica on Monday night with devastating force, killing at least seven people there, government officials. Two more people died in the French territory of Guadeloupe before Maria raked St. Croix. Hurricane Irma, which ranked as one of the most powerful Atlantic storms on record, also left a trail of destruction in several Caribbean islands and Florida this month, killing at least 84 people. The two other main U.S. Virgin Islands - St. Thomas and St. John - were both hard hit by Irma. Like much of the Caribbean, many homes and businesses across Puerto Rico have wooden or tin roofs that proved no match for a storm of Maria’s intensity. Maria was the second-strongest hurricane ever recorded to make landfall in Puerto Rico, behind the 1928 San Felipe Segundo hurricane, which struck the island as a Category 5 storm and killed more than 300 people. The island’s recovery could be complicated by its current financial woes, the largest municipal debt crisis in U.S. history. Both its government and the public utility have filed for bankruptcy protection amid disputes with creditors. Seventy percent of the island had lost power after Irma dealt a glancing blow on Sept. 6, killing at least three people. Passing early Wednesday just west of St. Croix, home to about 55,000 people, Maria damaged an estimated 65 percent to 70 percent of the island’s buildings, said Holland Redfield, who served six terms in the U.S. Virgin Islands senate. “There were a lot of homes that had lost their roofs. It was a sad sight,” Redfield said in a phone interview. Photos posted on Facebook from St. Croix by Virgin Islands’ local public television station, WTJX-TV, showed a tableau of fallen utility and telephone poles, tangled wires, uprooted trees and storm shutters ripped from buildings. In Guadeloupe, many roads were blocked and 40 percent of the population was without power, France’s overseas territories ministry said. Hurricane Maria, the strongest storm to strike Puerto Rico in nearly 90 years, carved a path of destruction through the U.S. territory on Wednesday, causing severe flooding and plunging the island into darkness as the storm’s death toll in the Caribbean rose to at least 10.